Just like in the comics, it seems Spider-Man can’t even catch a break on Broadway. 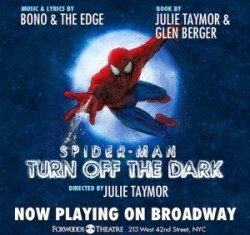 From less than kind reviews to stunt guys getting hurt, Spider-Man: Turn Off The Dark, once a promising musical production, looked like it was going to implode. But, in true Spider-Man fashion, the production dusted itself off and tried again. Now, after a brief hiatus and a rewrite, Spider-Man: Turn Off The Dark 2.0 begins their preview run once again. Turn Off The Dark tells the tale of Peter Parker, a high school student bitten by a radioactive spider that gives him super powers. At first, Parker uses his power for personal gain but when tragedy strikes, he learns that with great power must always come great responsibility.